About this Zippered Bag:These neat little zip-up bags are bound to carry your message out and about for extended viewing. Made of 210 Denier Nylon. Zipper is same color as pouch. About this Polytex Passport Wallet:Whether you're headed to see the Eiffel Tower or taking off for a business trip, the Paris travel document case will keep you organized and prepared!Constructed of non-woven 75 GSM polypropylene, this custom imprinted, fully zippered secure case features four inside pockets, pen loop (pen not included), six card pockets and see-thru mesh business card/ID pocket.Material: Polypropylene NOTE: Product comes with Prop 65 warning label. Label reads: "WARNING: This product may contain carcinogen, which is known to the State of California to cause Cancer and Reproductive Harm. For more information, go to www.P65Warnings.ca.gov. Special Instructions:Rush Service:May only be used on regular web quantity orders and one color imprints. About this Pedova Travel Wallet:Fully featured Travel Wallet that has an exterior pocket for Boarding Passes or other documents. Packed with a coin pocket, ID Holder, quick access passport pocket, five card slots, pen/stylus loop, and two large pockets for receipts or other items that every traveler needs. The zippered closure ensures that your valuables are kept safely inside. Pen not included. Manufactured By Leeds. Note: Instructions Included: No Materials: UltraHydeSpecial Instructions:Other imprint methods/areas may be available; please call for details. Please note that product images may not depict the standard imprint method included in pricing. About this Metropolitan(R) Travel Wallet:Open front pocket. Interior pocket for passport, travel documents, and currency. Elastic pen loop. Mesh ID pocket. Manufactured By Leeds. Note: Instructions Included: No Materials: Bonded Lthr Related Search Terms: Travel WalletSpecial Instructions:Other imprint methods/areas may be available; please call for details. Please note that product images may not depict the standard imprint method included in pricing. About this Metropolitan(R) Deluxe Travel Wallet:This leather travel wallet can double as creative gift packaging. Fill it with tickets to special events, travel vouchers and itineraries, or gift certificates before giving it to customers or employees. It features a removable passport holder for added flexibility and convenience when traveling overseas. Pocket with ID window for driver's license. Ticket sleeve. Button-down coin pocket. Multiple card slots. Pen holder. Zippered closure. Manufactured By Leeds. Note: Instructions Included: No Materials: Leather Related Search Terms: Travel WalletSpecial Instructions:Other imprint methods/areas may be available; please call for details. Please note that product images may not depict the standard imprint method included in pricing. About this Cutter Buck Bainbridge Passport Wallet:Just like the ever-changing weather in the Pacific Northwest, the Bainbridge collection is rich in contrasts. Genuine leather passport wallet with elastic and leather closure. Features two credit card slots, a mesh ID holder which protects your personal info from being seen by others, quick access Passport pocket, and large pocket for travel documents. Custom high-quality lining gives a premium feel inside and out.Material: Leather.Special Instructions:Other imprint methods/areas may be available; please call for details. Please note that product images may not depict the standard imprint method included in pricing. About this elleven(TM) Traverse RFID Travel Wallet:Streamline your business travelling with the elleven™ Traverse collection. RFID Technology encases your belongings to protect against identify theft. Fully featured travel wallet that has exterior and interior slotted pockets for your boarding pass, passport, and all other travel documents. Includes a privacy mesh ID holder, elastic pen holder, and additional slots for credit cards. Features multiple elastic slots to hold business cards. Perfect for international and domestic travel. Material: Vinyl Manufactured By Leeds.Special Instructions:Other imprint methods/areas may be available; please call for details. Please note that product images may not depict the standard imprint method included in pricing. About this Cutter Buck(R) Legacy Travel Wallet:Open front pocket. Interior pockets for passport, travel documents and currency. Hook and loop closure valuables pocket. Five slots for business cards or credit cards. Pen loop. Manufactured By Leeds. Note: Instructions Included: No Materials: Genuine Saddle Grain Leather Related Search Terms: Travel Wallet Special Instructions:Other imprint methods/areas may be available; please call for details. Please note that product images may not depict the standard imprint method included in pricing. About this Pedova Card Wallet:Very slim design that allows you to carry business cards or use as a wallet. The exterior pocket on one side has a clear vinyl windor for an ID, and the other exterior side pocket has two slots for credit cards, business cards or other item. The middle compartment is large enough to hold bills, loyalty cards, receipts or whatever you need to take with you. Manufactured By Leeds. Note: Instructions Included: No Materials: UltraHydeSpecial Instructions:Other imprint methods/areas may be available; please call for details. Please note that product images may not depict the standard imprint method included in pricing. About this Cutter Buck(R) Legacy Passport Wallet:Signature Legacy leather and vintage button closures accent the slim Passport Wallet, perfect for slipping into a pocket while traveling. Features two credit card slots, a mesh ID holder which protects your personal info from being seen by others, quick access Passport pocket, and large pocket for stashing money, boarding pass, receipts or other important documents. Manufactured By Leeds. Note: Instructions Included: No Materials: LeatherSpecial Instructions:Other imprint methods/areas may be available; please call for details. Please note that product images may not depict the standard imprint method included in pricing. About this BRIGHTtravels RFID Passport Wallet with Lanyard:Rethink the way you travel. Discover a world of difference with BRIGHTtravels products that enable you to travel lighter and smarter. This travel wallet can also double as a badge holder. With plenty of space to hold your most important items: passport, credit / ID cards, travel document, pen, and cellphone. Front PVC window is perfect for displaying a tradeshow badge. Attached lanyard has a breakaway function.Includes a Pack N' Guide with three packing tips to help you 'Pack Like A Pro'. Material: Ripstop.Special Instructions:Other imprint methods/areas may be available; please call for details. Please note that product images may not depict the standard imprint method included in pricing. About this Wenger(R) Leather Travel Wallet:Interior pockets for passport, tickets, and travel itineraries. Elastic pen loop. Four card slots. Hidden interior zippered organizer. Detachable key ring. Mesh ID pocket. Leather handle. Signature Swiss Army hardware and lining. Pen not included.Manufactured By Leeds. Note: Instructions Included: No Materials: Leather Related Search Terms:Travel Wallet Special Instructions:Other imprint methods/areas may be available; please call for details. Please note that product images may not depict the standard imprint method included in pricing. About this elleven(TM) Jet Setter Travel Wallet:Take storage and organization to a whole new level for any Jet Setter. Features a quick storage passport slot, four slotted pockets for credit cards, mesh ID holder, zippered coin pocket, pen holder, slotted pocket for boarding pass, and a techtrap area for a Smartphone, USB Memory, or other item. Manufactured By Leeds. Materials: 420d PolySpecial Instructions:Other imprint methods/areas may be available; please call for details. Please note that product images may not depict the standard imprint method included in pricing. About this RFID Blocker Card Pouch:This zippered card pouch is great for storing cash, credit cards, or other small accessories.It would block RFID signals and protect valuable information stored on RFID chips from unauthorized scans or unwanted readers.Material: Polyester.Special Instructions:1 Day Rush, available upon request for 1 color, 1 imprint location orders. About this Executive RFID Passport Wallet:Made Of Polyurethane3 Large Pockets For Passport, Cash Or Receipts, 3 Clear Window Pockets And 3 Card SlotsPlace Your Passport And Credit Cards In Holder And Close To Prevent Cyber Hackers From Stealing Your IdentityPrevents Data Transfer Between The Wallet And ReaderWorks With Any Contactless Chip Card. Cards That Are Swiped Do Not Send RFID Signals And Will Not Be Protected By An RFID BlockerSpecial Instructions:Rush Service:Catalog Quantities Only.One Color And One Location. About this RFID Data Blocker Wallet:Made Of Vinyl Material With Inner Metallic Foil Lining.Six Inside Pockets To Hold Business Cards, Credit Cards, Cash, Etc.Place Your Credit Cards In Wallet And Close To Prevent Cyber Hackers From Stealing Your Identity.Prevents Data Transfer Between The Wallet And Reader.Works With Any Contactless Chip Card. Cards That Are Swiped Do Not Send RFID Signals And Will Not Be Protected By An RFID Blocker.Special Instructions:Rush Service:Catalog Quantities Only.One Color And One Location. About this Shoe Wallet:Get your next promotion running with this handy shoe wallet! Run the strap through the laces of your gym shoes, and you have the perfect accessory for the gym or running outdoors. Ideal to carry your house or car key, ID, cash or other necessities. Strap passes through shoe laces and secures with hook-and-loop closure. Features fold-over top pocket and side zipper pocket. Materials: 600D PolyesterSpecial Instructions:Rush Service:The standard imprint method, 1-color/ 1-location is available. About this RFID Wallet with Phone stand:The RFID phone wallet encases your credit and ID cards.It keeps your Identify safe.It can hold up to 4 cards.The Phone Wallet can be placed on the back of your phone, with the add on function as your phone stand.Material: PU. About this Zippered Vylon Document Case:Keep documents, itinerary, ID cards, passport and other travel necessities in this soft touch vinyl deluxe case while on the road!Features of this fully zippered case include an outside pocket, four inside pockets, pen loop (pen not included), six card pockets and see-thru mesh business card/ID pocket.Material: Vinyl NOTE: Product comes with Prop 65 warning label. Label reads: "WARNING: This product may contain carcinogen, which is known to the State of California to cause Cancer and Reproductive Harm. For more information, go to www.P65Warnings.ca.gov. Special Instructions:Rush Service:May only be used on regular web quantity orders and one color imprints. About this Zippered ID Pouch / Wallet:PVC zippered pouch, with metal split ring inside.Perfect for IDs, change, and metro cards. About this Reversible Sequins Pocket Pouch:the Reversible Sequins Pocket Pouch features sequins in black and silver with a key ring attached.Perfect Size to hold keys, coins or cash.Keep cables, earbuds or cosmetics inside.Imprint on backside. Material: PU.Special Instructions:1 Day Rush, available upon request for 1 color, 1 imprint location orders. About this Millennium Leather Travel Wallet:Zippered closure. Pockets for passport, tickets, currency & travel documents. Five card pockets. Pen loop. Manufactured By Leeds. Note: Instructions Included: No Materials: Millenium Leather Related Search Terms:Travel Wallet Special Instructions:Other imprint methods/areas may be available; please call for details. Please note that product images may not depict the standard imprint method included in pricing. About this Cross(R) Travel Wallet:Premier leather wallet. Zippered closure keeps contents secure. Interior organization includes a Passport holder, ID holder, three business or credit card pockets, elastic pen loop, zippered pocket, and boarding document holder. Pen not included. Manufactured By Leeds. Materials: Bonded LthrSpecial Instructions:Other imprint methods/areas may be available; please call for details. Please note that product images may not depict the standard imprint method included in pricing. About this Cross(R) Travel Wallet with Pen:Set includes the Cross® Zippered Padfolio and Cross® Signature Mini Pen. Premier leather wallet. Zippered closure keeps contents secure. Interior organization includes a Passport holder, ID holder, three business or credit card pockets, elastic pen loop, zippered pocket, and boarding document holder. Pen not included.Manufactured By Leeds. Materials: Bonded LthrSpecial Instructions:Other imprint methods/areas may be available; please call for details. Please note that product images may not depict the standard imprint method included in pricing. About this elleven(TM) Traverse RFID Passport Wallet:Get down to business while travelling, with the elleven™ Traverse Collection. RFID Technology encases your belongings to protect against identify theft. Features a quick storage passport slot, mesh ID holder, elastic pen holder, slotted pocket for boarding pass, and an additional slot which comfortably hold 10 credit or loyalty cards. Material: Vinyl Manufactured By Leeds.Special Instructions:Other imprint methods/areas may be available; please call for details. Please note that product images may not depict the standard imprint method included in pricing. About this elleven(TM) RFID Travel Wallet with Power Pocket:Travel made smarter! This RFID travel wallet hold three credit cards and a Passport. It has an integrated pouch for a power bank (max size 1" x 1" x 4.5") and a mesh pocket for the charging cord. Alternatively, place a slim power bank (max size 5.5" x 2.5" x 0.25") into the mesh pocket and the charging cord into the integrated pouch. Includes a place to securely hold your phone (max size 6.23" x 3.07" x 0.29"), plus two additional pockets for travel documents and cash.Material: UltraHyde.Special Instructions:Other imprint methods/areas may be available; please call for details. Please note that product images may not depict the standard imprint method included in pricing. About this RFID Card Wallet:This RIFD card sleeve encases your credit and ID cards and keeps your identify safe! Can hold 6-8 credit cards or 10-15 business cards. "RFID" is engraved on the back, bottom right corner.Material: Aluminum.Special Instructions:Other imprint methods/areas may be available; please call for details. Please note that product images may not depict the standard imprint method included in pricing. About this Modena Slim RFID Passport Wallet:Premium, textured UltraHyde material. Specifically designed to hold a passport, 4 credit cards and a boarding pass/ticket. RFID protection. Material: PU.Special Instructions:Other imprint methods/areas may be available; please call for details. Please note that product images may not depict the standard imprint method included in pricing. About this RFID Card Slider:Stay protected from RFID identity theft while keeping all of your credit and debit cards stored in this minimalist design all-aluminum card wallet.Card slider feature makes it easy to sort, view, and access your cards with ease.Aluminum case, 4" x 2.5".Material: Aluminum.Special Instructions:Other imprint methods/areas may be available; please call for details. Please note that product images may not depict the standard imprint method included in pricing. “Hello The neck wallets are great and I love them. there are no defects involving the neck wallets Thanks for your timely shipping of my order. I do look forward to future orders. have a great day” - E. J. Thank you E.J.! We make sure to always have top quality items, and glad that the wallet fulfilled your promotional need. We work hard to make sure every customer gets their item in a timely manner. That’s right Teresa! It works well not only for bus drivers, but for any event. Even for the event itself! These are a huge hit, and will be useful for your next promotional giveaway. Don’t miss out on one of our Top 100 items! Questions? Live chat with a customer representative or call us at 1-877-368-5678. Features a 4" x 3" clear plastic badge window, outside business card pocket and 2 pen loops. Features an internal zippered compartment and breakaway neck cord. Available in 14 great colors:royal blue, black, khaki, forest green, red, yellow, orange, kelly green, neon pink, navy, turquoise, burgundy, purple, lime green. Thank you Luis and Cristian! Employees love to represent the company they work for. Why not give them a wallet with their company logo? This custom wallet has enough space inside to carry the most important documents you need at your side. From money to passports, this wallet will secure them all. Your customer will be able to take this safe, convenient wallet everywhere they go! 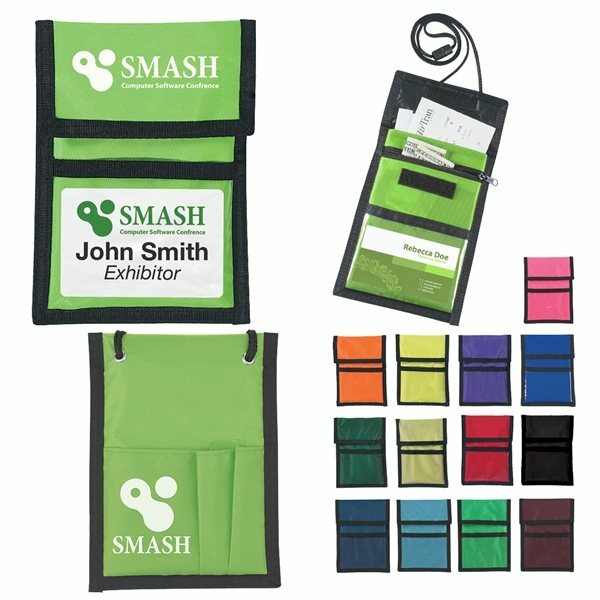 Constructed of non-woven 75 GSM polypropylene, this custom imprinted, fully zippered secure case features four inside pockets, pen loop (pen not included), six card pockets and see-thru mesh business card/ID pocket. Get your Polytex Passport Wallet today! We always make sure the imprint on every product is perfect. The customer will always come first, and we make sure to deliver the product you’ve envisioned. The Nylon Carabiner Wallet is a featured item on our wallets section because of its popularity and unique look. It will secure your keys as you clip them all together. Make this a popular giveaway at your next event! It’s small size makes it convenient for those customers who carry their most essential cards. Outfitted with our unique and exclusive combo of a suede-style supported vinyl stitched to coarse-weave khaki nylon. Carabiner, ID Card Window, Multi-purpose Pocket, Secure Velcro Closure, Zip Pocket for securing your coins or keys. Available in black vinyl, royal blue, red vinyl, assorted. Save your money with this promotional wallet. Order here. With over 100 custom wallets available to your selection, your customer will be able to organize their ID's, credit cards, and change with our options. Looking for a specific material? We have a variety of wallets available from leather, leatherette, nylon, microfiber, and more. The different styles of wallet will allow you the option to look for the perfect fit as your promotional item. Wallets are convenient for anyone to get organized! Help your customers get rid of all those unwanted receipts with our choices of wallets. Our options are good to give at any event! Let us help you narrow down the choices. Check out our options here! Our custom personalized wallets and badge holders are specially priced and professionally imprinted to vividly promote your brand. Search our site for a wide selection of custom wallets and badge holders and see for yourself just how high AnyPromo’s standards are when it comes to brand impact. Check out our custom neck wallets and badge holders on sale now. Take a peek at of our hot selection of promotional wallets and badge holders currently available. We’re ready to help expedite your order, so give us a call! Wallets will never go out of style! It’s a customers every day product they need to make their life a bit more easier. Shop by material, price, or color! You’ll find the perfect one in our selection. Get your logo on one of our promotional wallets today! Your customers will be cleaning out their old wallet to use their new one. Need help choosing? Our customer service team is standing by on our live chat to answer any of your questions.